Wood Swivel Memory Stick – the World’s most popular customizable USB with a wood twist! This model is as refined as they come. Take a wooden body that holds the USB memory chip & connector and add an Aluminium Swivel Clip to protect it when not in use. Most of the edges are slightly curved and to me this helps instill the natural element that the wood also provides. If you look closely you might see that at the far end of the Aluminium Clip there’s a small loop which means this model is also Keychain and Lanyard compatible. If you’re relatively new to the world of Custom USB Flash Drives then let me start by explaining that this same model but with a Plastic rather than Wooden body is the most popular Memory Stick on the whole market. It’s low cost, practical, versatile and because of this – it’s hugely popular. However, what we’ve seen in recent years is many buyers looking for something slightly different. They’ve used the Aluminium Swivel and loved it but they’re now looking for something a little different to help them stand out – trouble is they still want to keep all the great functions the model provides. That’s where the Wood Swivel steps in and ticks every single box. Whether you’re an environmentally conscious company or a little more corporate it’s hard to top this model. Photographers traditionally prefer all Wood when it comes to their memory sticks but for me this model is equally suitable and I’ll let you into a well kept secret – engraved metal often looks even cooler than engraved wood. At 57 x 18 x 9mm it’s mid sized and because it has a wooden rather than plastic body it’s a little heavier than it’s ever popular cousin. With the base materials already giving a very tactile quality the Swivel section is another part that people just can’t help testing and turning themselves. The wooden section is available in several awesome shades including; Maple, Bamboo, Rosewood and Walnut. The Clip section is available in; Silver, White, Black and can even be Pantone Colour matched to suit your needs. It’s not often found in the Flash Drive world so the combination of Wood and Metal is just such a brilliant surprise for clients who receive this model. Combining the premium feel of Wood with a practical low cost metal swivel section it a genius idea that we just wish we’d thought of sooner. This model should be considered by almost everyone. It’s not too hard to understand why the original Aluminium Swivel is so popular but at the same time I appreciate why some people may be looking something new – up steps the Wood Swivel! 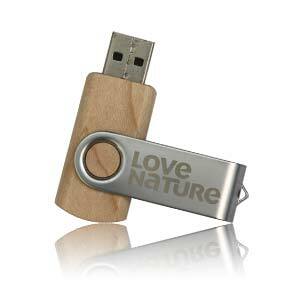 For a quote simple head to the product page – Wood Swivel USB Flash Drive.